*This HowTO has been improved and edited since it's initial posting! AV Linux 2016 comes out of the box with an Audio and MIDI Loopback routing system set up to work independently without PulseAudio and provide similar routing capabilities. 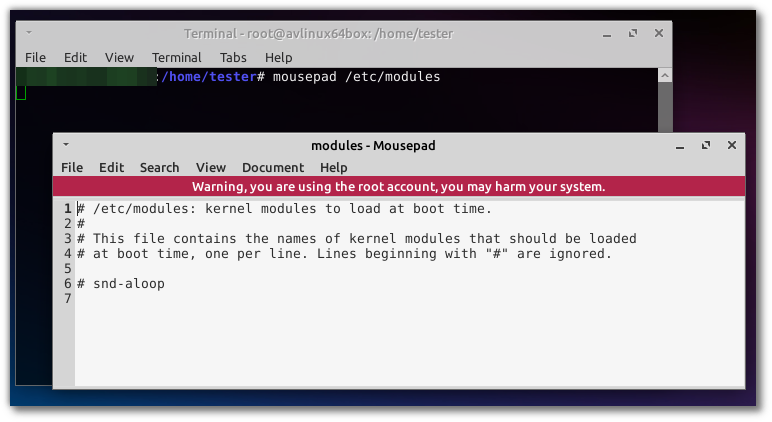 For many people this is an ideal setup so if you are one of those people there is no need to change anything on your AV Linux 2016 install. However as time moves on PulseAudio has become a dependent package in most Linux Distribution's packaging of Desktop Environments, some web browsers (ie Firefox 52+) and some important 3rd party applications (ie Skype) will only work on a system with PulseAudio installed. 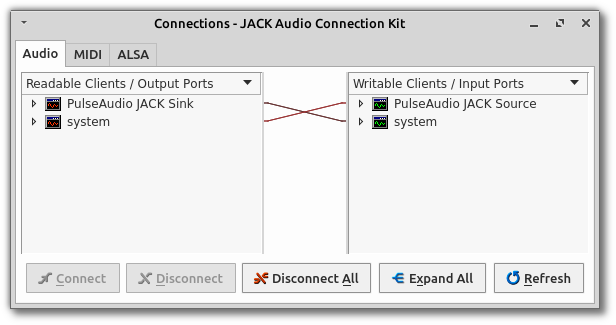 Moving forward PulseAudio and JACK will have to be set up to coexist peacefully on AV Linux and this guide will show you how to get this up and running (if needed) on an existing AV Linux 2016 system. Note this Audio routing setup will be the default on all future '2017' versions of AV Linux. The current Audio routing system on AV Linux requires a kernel module called 'snd-aloop' to be loaded at boot, this will no longer be required and will only confuse the number of Audio devices that appear on the system so we need to tell the system not to load that module any longer at boot, this is done by editing the 'etc/modules' text file as Root. This will open the 'Mousepad' text editor so we can comment out 'snd-aloop' with a hash (shown on line 6), Once you have done this Save the 'etc/modules' text file in Mousepad. Before you install the pajackconnect script you need to have PulseAudio and a few dependencies installed, these are not included in AV Linux 2016 so you will need to install them first before installing and using pajackconnect. 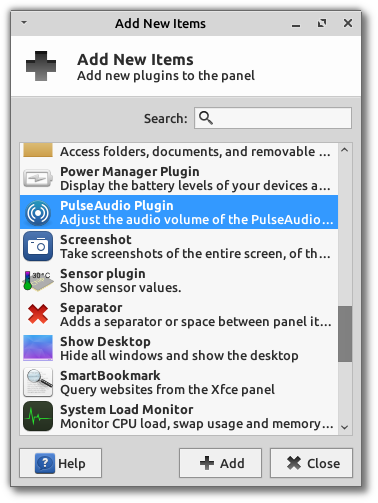 *For AV Linux 2016 or if you use XFCE4 as a Desktop on Debian or Ubuntu you may want to optionally install the xfce4-pulseaudio-plugin to run the PulseAudio Mixer from your Panel.. STEP 3: Modify Qjackctl 'Options' to use the new pajackconnect script. *IMPORTANT if you have Qjackctl set to automatically launch when you login, disable it for now, on our next boot we want to run Qjackctl manually. STEP 4: Reboot your system to ensure it starts without the 'snd-aloop' module, then we can see if our system changes are working. On your fresh boot launch the Qjackctl UI and click 'Start', you may want to check in Qjackctl if the Audio device you normally use is selected since the removal of the 'Loopback' device will change the numbering of the Audio devices. 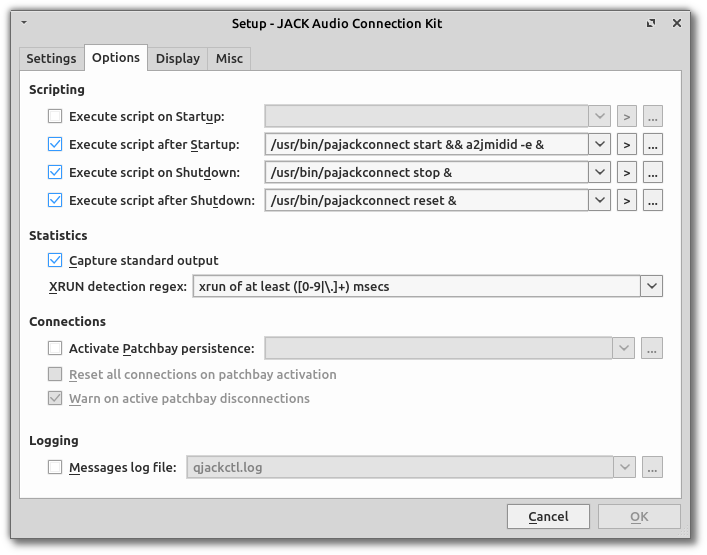 Once you start JACK it will take the pajackconnect script a few seconds to start, it is possible on the first run it will not create the PulseAudio jack ports properly and fail, if this happens close the Qjackctl UI completely and try it a second time if this happens. If JACK starts properly you should see this in the 'Connect' Window. As you can see, there are now PulseAudio JACK 'Sink' and 'Source' ports, this means applications using PulseAudio are being routed through whichever device you have selected to run with JACK. This is similar to the previous AV Linux aloop-daemon, however instead of ALSA/JACK we are using PulseAudio/JACK. STEP 5: OPTIONAL: Add the mixer control to your panel. If you want the PulseAudio volume control on your Panel you can add it by right-clicking on your Panel and 'Panel'-->'Add New Items' then find the PulseAudio plugin and add it. STEP 6: Clean up unused packages. If you are happy with how this new routing system is working and are sure you don't want to return to an ALSA Loopback system you can use Synaptic to remove the 'aloop-daemon' and 'jackutils-script' packages from AV Linux 2016 as they are no longer needed. The 'aloop-daemon' will no longer work with the 'snd-aloop' module disabled. -This may not work with starting Qjackctl at login, Now that PulseAudio routes all the usual Desktop stuff I personally only launch Qjackctl when I want to do Audio work.. YMMV. -I am using this script with JACK2, it should work either way but AV Linux 2017 will come with JACK2 so that is why I have set it up this way. Thanks for trying it out and confirming that it worked for you. My use case is different to what most folks on here may want. I have Pulseaudio left on and use QjackCtl with D-Bus enabled. that uses the Pulseaudio module jackdbus detect and would give you the same connection layout as in OP with no script required. Thanks for the added info, I personally have avoided P.A. like the plague for as long as possible and am still very much a newb at configuring it so 'power user' tips are welcomed. Making it work on suspend as well isn't as hard. No really hack is needed. All we need is a systemd.service file included. Wow, thanks!! The last piece of the puzzle is solved! Description: Start/stop JACK on a system running PulseAudio via QjackCtl, includes systemd service file for Suspend. Since these are only text-based scripts I changed 'Architecture:' 'any' to 'all' so I can compile both architectures on one system. Thanks very much again for the finishing touches! Thanks so much for sharing. I wasn't able to get any audio through Firefox with my internal soundcard on my laptop until I followed your tutorial. Same, I followed this guide yesterday and it fixed my sound issue however today there's no sound again. Are you sure Firefox is playing back through the 'Jack Sink' in the PulseAudio Volume control? I have had upgrades of Firefox change the settings to try and access the Sound card directly which results in no Sound because JACK is using it and routing the Audio through Pajackconnect and the PulseAudio sinks.. See the attached screenshots for what to look for.. I have Qjackctl (and jackd) running and there is not any Firefox's item on the Playback tab. There is a Jack Sink device on the Output Devices tab. Hence no sound from Firefox. I've read the article thanks to your kind RTFM directive and would like to contribute a little addendum. As of this moment I can think of no utility that needs proper documentation more than qJackctl. Minimally this would consist of bubble popups that explain the terminology to common mortals (99.99% of the planet). "We pedestrian hordes" haven't got a freakin' clue about what a client is in a computer, a patch-cable that is not a telegram from dispatch, a sink that is not in the kitchen, writable hardware, or ports that no ships tie up in. Point made I think, here's a few examples but I am no manual writer so whoever knows better is welcome to red-pencil it, I will not be offended. A server is any hardware, executing program, storage or method or protocol that delivers what has been requested by the paired (hardware, executing program, storage or method or protocol) called the client (of the server). Similarly a server is readable while the paired client is writable. A port is the theoretical unidirectional equivalent of a hole in the wall like an electrical outlet. There being input and output ports to accommodate equally conceptual patch-cables, see your home entertainment nightmare for a clear example. We cannot take this any further in a gender-free society, but on a Harley the head intake/exhaust ports might also come to mind including the sound on poorly cooled 486 boxes. A sink is another name for a receiver or client. I have no idea on the etymology but that's the jargon.